My blogs post will resume shortly. In the mean time, I will leave you with a story we may have missed recently. Sharks are like hurricanes; nobody wants to be near one, but they are fascinating to watch, and learn about. There is a cool link to follow the shark in the story below as well as a statistic about shark fin soup; an ingredient that dooms the shark to a slow and cruel death when only the fin is cut off, and the shark is thrown back in to the water. Deb, thanks for the title movie quote! Anno Domani, the next time we mention IFAW! CHARLESTON, S.C. (AP) — It seems Mary Lee’s winter vacation in the sunny South is over. 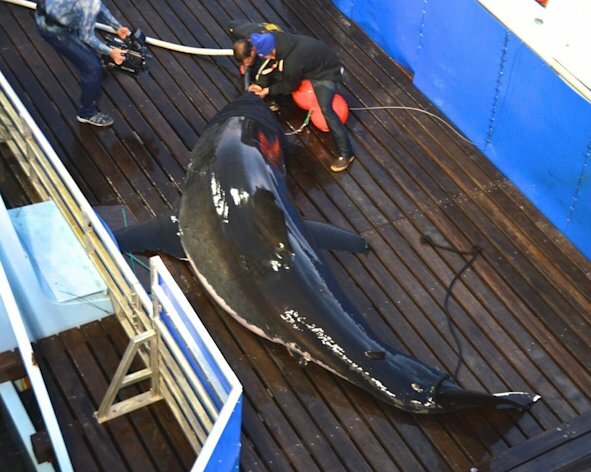 The 3,500-pound great white shark headed north after spending weeks off the Southeast coast. Mary Lee, one of only two great whites ever tagged in the North Atlantic, got as far south as Jacksonville Beach, Fla., several weeks ago. But in recent days, she’s made a bee line north. On Thursday, she was off Long Island, N.Y. Researchers can’t really say they are surprised because the habits of the great whiteare such a mystery. “Lo and behold, Mary Lee goes down there for a little while and then bugs out and now she’s off Long Island and we realize we don’t know anything,” said Chris Fischer, the founder of OCEARCH, a nonprofit dedicated to studying great whites and other large marine species. Fischer’s group has tagged dozens of great whites off South Africa and in the Pacific. He led the September expedition to tag Mary Lee off Cape Cod, and named the shark after his mother. The group also tagged a second great white, Genie. “Jaws,” the 1975 blockbuster movie directed by Steven Spielberg, was a fictitious tale of a great white causing havoc at a small New England island community. Capturing a great white weighing upward of 2 tons is no easy feat. The expedition used its 126-foot research vessel, designed with a special lift that can bring up 55,000 pounds. “We bait the shark and once we are pulling on the shark we walk it back to the ship and over the lift. The lift then pulls it out of the water,” Fischer said. While on the boat, a device that relays the shark’s position to a satellite is attached to its dorsal fin. As many as 100,000 people a day are monitoring the position on OCEARCH’s website. Traffic got so heavy this winter the organization had to upgrade its servers, Fischer said. “This is modern day exploration. I wanted the public to be able to see a part of that,” he said. The other great white, Genie, also headed south for the winter. But because she doesn’t surface as much, her travels have been harder to track. Genie’s last position was recorded Jan. 19 off the South Carolina-Georgia border. Fischer said it’s important to learn more about sharks, which are at the top of the food chain in the ocean but threatened by man. He said 73 million sharks a year are killed just for their fins to make shark fin soup. In recent years, he added, people have become fascinated by sharks, which will help efforts to understand and protect them. Nice “fish” story to deflect from your “vacation”. Start writing soon. want to encourage you continue your great work, have a nice weekend!